A community-based water quality monitoring group established in September is already proving its worth to scientists trying to get hard data on how much sediment and nutrient run-off is flowing into the Great Barrier Reef from the Bowen, Broken, Bogie (BBB) catchment, around Bowen and Collinsville. The water quality monitoring effort is part of the Landholders Driving Change (LDC) project, which focuses on catchment-scale solutions to improving land management, pasture cover and the quality of water running off to the reef. Monitoring and evaluation is an integral part of the LDC project – one of two Queensland Government-funded Major Integrated Projects (MIPs). 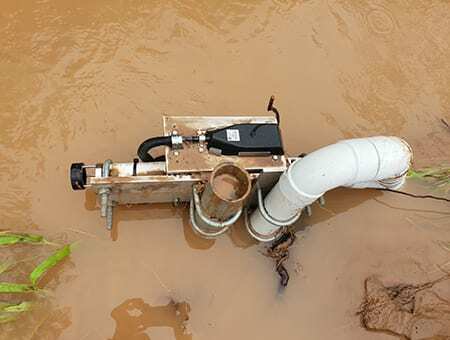 Monitoring, Evaluation, Reporting and Improvement Officer at NQ Dry Tropics, Barb Colls, said water samples needed to be collected from flowing streams during, and immediately following, rain events. “They’re tributaries to the main watercourses, so they only flow when it rains,” Ms Colls said. Since September last year, local landholders have been trained and have successfully collected water samples on five of nine properties selected in the BBB. 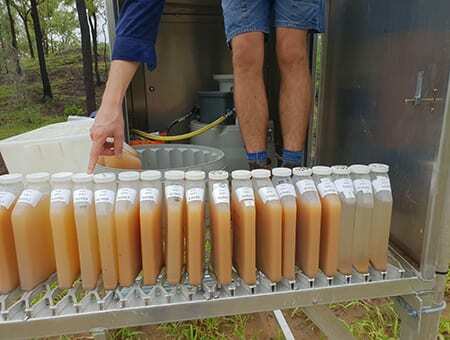 When ex-Cyclone Penny made its way across part of the BBB in early January, four properties captured water samples at monitoring sites as the flow started, again at its peak and as water levels fell. Between members of the monitoring group and the material collected from automated sampling sites, a total of 106 water samples were taken. “That was a big rain event, but it was patchy, with very intense rain in some areas, through to almost no rain in other areas,” Ms Colls said. 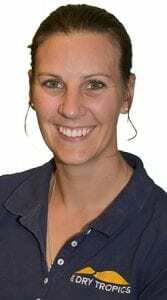 She said the local knowledge among landholders in the water monitoring group was crucial to the success of the program, which would run until the end of the 2020 wet season. “The people who live and work there, know their land,” she said. She said the monitoring sites were close to each homestead, and samples could be collected without too much interruption to the normal workday routine on the property. Samples are collected using a modified pool-cleaning scoop to easily get the sterilised sample bottles out into the current for filling. Details of the date, time and water level in the stream are recorded on field sheets and the samples stored in fridges and freezers until they are collected and analysed in the lab. Ms Colls said the water monitoring group made a direct and active connection between farmers and scientists. Scientists will share what they learn from the data with landholders, ensuring everybody benefits as graziers and technical experts strive together to improve water quality. 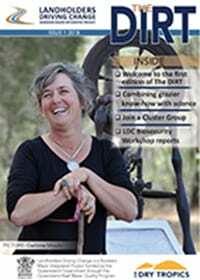 Visit the NQ Dry Tropics website at www.nqdrytropics.com.au for more details.